Those of you who haven’t spent the last several years living under a rock will most likely have heard of web services giant, GoDaddy. So, whether you’ve seen their latest TV commercial or heard about them elsewhere, what you really want to know now, is whether GoDaddy live up to their own hype, and whether their Deluxe hosting plan is a worthwhile investment for your next website. In the following GoDaddy review, I’ll weigh up the pros and cons of this package to help you make that big decision. Sticking with the tried and trusted multi-tier hosting model, GoDaddy offer a range of different hosting packages ranging from low cost, entry level plans suitable for small sites, right up to all-powerful, no expense spared plans that make a good option for high traffic sites and those requiring advanced functionality. For the purposes of today’s review, I’m going to focus on the plan that’s sandwiched right in the middle of those two; the £3.99 per month Deluxe shared hosting package. It’s the one plan I think represents the best value for money. Indeed, whilst the £2.99 Economy package may be £1 cheaper, the limited storage space of just 100GB for a single website only makes this a good option for those who only need hosting for one single, small website. If that sounds like you, you might well have no need to pay any more than the cost of the Economy plan (which will eventually set you back £4.99 per month after the first term expires). For the rest of you, particularly those of you who may be looking for an unlimited hosting plan capable of supporting multiple website projects, Deluxe is certainly the way forward. 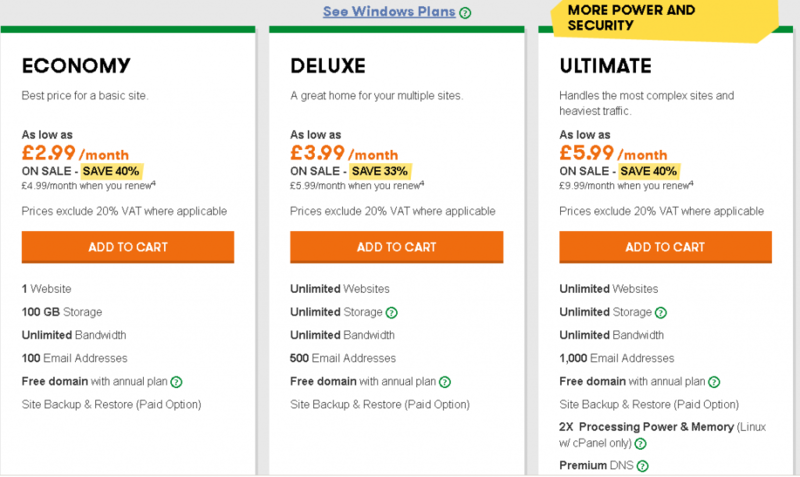 After the £3.99 discount term expires, you’ll be looking at paying £5.99 per month, which puts GoDaddy’s pricing at the cheaper end of the scale, with similar plans from the likes of iPage costing the better part of £9 per month after the first term expires. – 500 MB total email storage. Admittedly, the number of email accounts, and particularly the low amount of storage, don’t exactly make GoDaddy an ideal solution for customers who make need much heavier email use, but for small businesses with limited email needs, I still think the overall price and list of features makes this a solid investment. As you’d probably expect from a company who started their journey to the top of the web industry by specialising in domain names, there’s actually a lot of good to say about GoDaddy in this particularly area. First, the standard free domain name registration offered by many top hosting companies is here, though unlike services such as eHost, this is only for a single term of either 12, 24, or 36 months, after which you’ll need to pay the full, regular renewal rate for your new domain. That said, domain renewals here are at least typically cheaper than many of GoDaddy’s competitors, with the costs typically combining with the reasonably priced regular hosting fees to make this an attractive option for long-term hosting on a budget. The cost isn’t the only thing I really like about GoDaddy’s approach to domain names. Managing and configuring your domains is -in my opinion at least- easier to do with this particularly company than perhaps any I’ve seen so far. Just as practical and efficient for managing multiple domains as it is a single one, the control panel here is well laid out, and even tackling some of the more complex issues like setting up new Domain Name Servers is straight-forward. Coupled with the fact that GoDaddy Deluxe hosting supports unlimited add-on and sub-domains, I would say that if you’re planning to have (or already have) a number of different website addresses for your projects, GoDaddy is one of the easiest and most affordable options for managing all of them through one simple interface. Whatever flaws GoDaddy may have in other key areas, they’re hard to fault when it comes to ease of use. To be fair, this isn’t too surprising. A huge part of the company’s success has been their ability to strip out technical jargon and do away with many of the more technical aspects of web hosting, replacing both with easy-to-understand terms, and a very intuitive user interface where everything is laid out in a clear, simple-to-navigate style. One of the things I really like about the company is that, as soon as you log-in, you have direct access to many of the key areas of your hosting plan right from the top menu. Managing domains, email accounts, and your general account was a breeze, certainly easier than it has been with those high-end hosts who bury such features behind the scenes,and absolutely better than the likes of HostGator, who -as I mentioned in one of my most recent reviews- force you to use an entirely separate browser tabs for account management and general website management. Speaking of the latter, GoDaddy’s Deluxe shared hosting plan comes with cPanel, the industry-leading web hosting dashboard where everything is accessible through a series of large, visual icons. Using your cPanel, you can do everything from launch website building applications like WordPress and the drag-and-drop website builder (more of these later) to more complex tasks like setting up website analytics and configuring your domain hosted email to work with your desktop email client. By and large, I’ve found GoDaddy to be one of the easiest hosting companies to use, so if you’re relatively new to hosting websites and looking for something that’s simple to set up and manage, this is certainly a company I’d be glad to recommend. Though GoDaddy certainly get a lot of things right, I still think the company has some kinks to iron out before they’ll be as renowned for the reliability of their hosting services as they are for their competitive costs and user friendliness. Though I’ve found their performance rates to be decent enough for small, static brochure websites, running a powerful Content Management System like WordPress does have it snags with this company, with loading speeds for several of my projects leaving something to be desired. The same can be said about the general level of uptime. In fairness, I’ve yet to experience any major, lengthy bouts of downtime with my own projects, but I have seen enough temporary server outages during the year’s that I’ve used GoDaddy to be wary of using them for more important projects. Rather, I tend to look at the company’s average 99.85% uptime records and choose this host only for small, personal websites such as a blog which, though it still needs to be online the majority of the time, isn’t going to cause any disasters to my business if the hosting server temporarily goes down, much as it’s often prone to doing with GoDaddy. If you’ve read this far, you’re probably starting to sense a theme here: GoDaddy’s shared hosting is far better suited for small websites with mid-level traffic than it is for powerful, high performance sites. Not that keeping away from large-scale projects means you have to stick with a small amount of options for building your sites. There’s actually a lot to like about GoDaddy Deluxe when it comes to actually getting your website off the ground. For intermediate and advanced users, one-click installation of over 125 applications is available through cPanel, and allows you to launch all the usual CMS platforms like WordPress, Joomla, Drupal, and Magento, whilst also taking advantage of tools and features to add greater functionality, interaction, and increased performance to your website. Meanwhile, I suspect that beginners may prefer to use a drag-and-drop website builder. GoDaddy actually bundles one of these tools together with other hosting essentials into its own paid-for-separately package, though I have found that by going into cPanel and looking through the one-click application library, a couple of the more common website builders are available for free with your hosting plan. As with the paid version, these tools allow you to load up pre-designed templates, drag elements into place using your mouse, and customise the whole thing to suit your style and content. Doing so with GoDaddy’s tools is as easy as it is with other hosting companies, and in my opinion are an ideal solution for those looking to create a professional looking website with a limited budget and limited technical skills. Finally, I’d be remiss if I didn’t mention the fact that GoDaddy offer their plans based on both Linux and Windows operating systems, the latter proving particularly useful for more advanced users who need greater control over their shared hosting space and increased performance whilst still retaining basic hosting features such as one-click installations. If you are considering Windows based hosting as option, you’ll likely be glad to note that these plans cost exactly the same as their Linux based equivalents. Once upon a time, free search engine advertising credits for Google and the Yahoo!/Bing network were a fairly standard feature in hosting packages, usually included in an effort to make shared hosting plans like GoDaddy Deluxe appear to represent even greater value for money. The more I spend time with a number of hosts featured on this website, the more I’m starting to see that this is no longer the case. Indeed, though some still offer this service, GoDaddy are one of an increasing number of shared hosting providers withdrawing their offer of free credits. Currently, none of the company’s plans offer these, though there are other marketing and advertising tools available. As seen in the video above, the email marketing features are an especially effective addition to the plan, whilst Search Engine Optimisation (SEO) and analytics tools are accessible from your dashboard, and can be big help in ensuring your website is picked up by search engines. Though you can technically build an online store with GoDaddy Deluxe hosting, making use of an SSL certificate for data encryption and over-all site security is going to set you back at least £48 per year. Whilst this is no doubt cheaper than with other companies (at last count, eHost charged no less than £100 per year for SSL), it’s still a significant increase in the cost of your website, and hardly ideal if you’re looking to do things on a budget. Instead then, I recommend upgrading to the GoDaddy Ultimate Shared hosting package. At time of writing, this was on sale for a very reasonable first term cost of just £5.99 for a 12, 24, or 36 month contract, after which prices increased to £9.99. With this package, you not only get the free one-year SSL certificate (as handy for increasing your websites rankings on search engines as it is for protecting customer data), but also increased processing power and an additional 500MB of email storage, putting your total at 1GB. This, combined with support for Magento, PretaShop, ZenCart and all the usual, industry-standard eCommerce tools, makes Ultimate a solid option for those with intermediate and advanced users, though complete beginners may want to consider investing a little more money in GoDaddy’s eCommerce-focused package. Though costing twice as much (prices on my last check were £20.99 per month), this does include a drag-and-drop online store builder, built-in payment processing, a dedicated IP address and all the standard hosting features to boot. There used to be a time when I constantly raved about how good GoDaddy’s customer support team were. As the preferred hosting company of a number of my clients, I spent a good amount of time working with them to do everything from upgrading from a shared hosting plan to a Virtual Private Server to configuring complex scripts to add greater functionality to my websites. On the whole, all of this went smoothly, but when a problem did arise, I usually reached out to customer support either via live chat or over the phone. At first, response times were faster than I’d experienced with any other hosting company, and the support reps I dealt went out of their way to help me resolve issues in a friendly manner without ever resorting to overly complex terms which would perhaps leave newcomers searching for the nearest hosting jargon translator. It was this kind of fast, efficient, and friendly service that helped GoDaddy win awards for their customer service, and helped me to have no problems in recommend them as a shared hosting provider for novice website owners. Then things started to change. Whether those early support reps moved on to bigger and better things or simply stopped caring, I couldn’t tell you, but I can tell you that I noticed a gradually ever-steeper decline in the level of service offered by the company. It started taking much longer for somebody to answer a call, and a few times live chat took so long that I eventually gave up and spent the time looking at fixing the problem myself. The one thing that was consistent however, was the email ticket support, which throughout all the years that I’ve used GoDaddy has remained pretty average when compared to the same service from other top hosting brands. The good news, is that if the customer support team were not performing as good as they once did, there was -and still is- a helpful library of tutorials, Frequently Asked Questions and help guides which make it possible for customers to tackle most common issues by themselves. From my own experience, I’ve found these to be clear, concise and well-written, and if nothing else I can definitely commend the company for their knowledgebase. Though their excellent user-friendly approach, competitive costs and multiple website building options have definitely helped GoDaddy become one of the most recognisable -and widely-used- hosting companies on the market, they’ve still got a long way to go before I’m willing to consider them kings of the proverbial mountain. Below-average server uptime levels and a customer service department which has been getting steadily worse over recent years do leave me with something of a sour taste in my mouth, but on the whole I’ve found GoDaddy Deluxe and other shared hosting packages from the company to be good value for small business websites and personal projects alike. I have seemed to have covered a lot throughout this godaddy review and have tried to include as much detail as possible. I have to admit though there are better performing companies out there such as iPage & SiteGround who are slightly less well known but far out perform GoDaddy in terms of performance and customer support. After all GoDaddy is famous for being a domain registrar, not a hosting company.